Krav Maga, the fighting system developed by the Israeli armed forces, is recognized today as the "Gold standard" of martial arts (to quote Rabbi Mike Datz of Illinois). The Yeshiva world has been recognized for centuries as the gold standard of academic achievement. If you can master the Talmud, everything else is easy by comparison. Nothing sharpens the mind like Talmud study, nothing prepares you for real life self defense like Israeli Krav Maga. Training students at Yeshiva University, NY. I began my martial arts training while a student at the Mercaz HaRav yeshiva in Jerusalem. 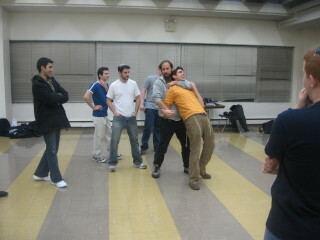 I felt I needed some exercise and for years Rabbi Meir Kahane had been advocating martial arts for yeshiva students. The style being taught was Shurin ryu, the teacher was Chaim Jaffe, it was my first taste of martial arts but certainly not my last. Over the years I have trained in Kyokushin karate, judo, jujitsu, Brazilian jujitsu, submission wrestling, Wing Chun kung fu, Control Points and Defensive tactics, Thai boxing and kickboxing, and Krav Maga. I have had the privilege of training with some of the greatest martial artists of this generation. I have put all this together in a uniquely Jewish and Israeli way; practical Krav Maga. This style is a perfect match for yeshiva students, or anyone with little time. Unlike martial arts that take many years to master, or even to become mildly proficient, our Krav Maga is simple, effective, and easy to learn. A yeshiva student's primary task is mastering the Talmud, he does not have hours a day to learn a traditional fighting art, Krav Maga is the perfect solution. It is said that martial arts is a way of life, and this is true in the most positive sense. However, the Jew who lives by the Torah already has his way of life; the Torah. He does not need a new philosophy. What he does need is a practical method of self defense, and, it just so happens, that this is part of Torah too, a neglected part. If you study the entire Torah, carefully, you will find that our forefathers and our Biblical spiritual leaders were all accomplished fighters as well as Torah scholars. Learning self defense is Torah, as it says "and you shall live by them". I have taught Krav Maga at many yeshivot in Israel and in the USA such as Mercaz HaRav Kook yeshiva High School (Jerusalem), the Maaleh Adumim Yeshiva, Yeshiva Or Torah,(NY), Yeshiva University, Fuches-Mizrahi High School,(Cleveland) and others. Thank you very much for all that you did for me this year, the training helped me in unbelievable ways. My learning has improved because of my confidence which I acquired from my training. I'd like to thank you for that."